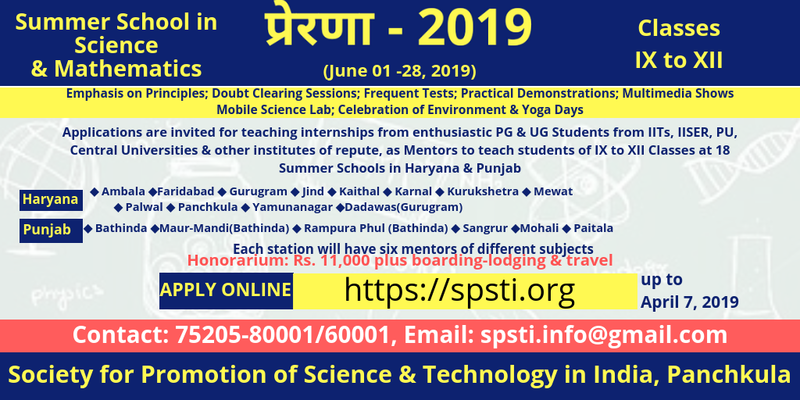 The Society for Promotion of Science & Technology in India (SPSTI) has decided to hold eighteen summer schools in science and mathematics, twelve places in Haryana and six in Punjab, for teaching science and mathematics to the students of classes IX to XII. The locations in Haryana are Barwala (Panchkula), Naraingarh (Ambala), Yamunanagar, Kurukshetra, Karnal, Kaithal, Jind, Gurugram, Faridabad, Palwal, Nuh (Mewat) and village Dadawas near Pataudi in Gurugram. The locations in Punjab are Bathinda, Maur Mandi (Bathinda district), Rampura Phul (Bathinda district), Sangrur, Patiala and Mohali. Maur Mandi and Rampura Phul are Sub-Divisional Headquarters and well connected with rail and road. The SPSTI would appoint 108 UG and PG students (six per Summer School) of prestigious institutes and universities to teach and mentor the students of schools. Online applications are invited from the students of IITs, NITs, Central Universities and prestigious colleges to work as Mentors to teach and manage Summer School in Science & Mathematics. The Online applications can be filled up to 07.04.2018, after which the link will be disabled. The candidates are advised to apply online well in advance without waiting for the last date of submission of online application form. No offline application form shall be accepted. Important Restriction: The Summer Schools at Dadawas, Nuh (Mewat), Jind, and Palwal are open for Male candidates only. However, if a female candidate hails from one of them, she can apply for that Station. Eligibility Criteria: Any candidate, who is pursuing B.Tech., B.E., B.Pharm., B.Sc. (Hons), B. A. (Hons) in Maths, M.A. in Maths, M.Tech, M.Sc. (two years or five years), Integrated M.S. and Ph.D courses or any other Graduate or Post-Graduate in Science/Technology/Engineering course is eligible to apply for this internship. However, the candidate should have working knowledge of Hindi/Punjabi and English. In the past, several students from the Eastern, Southern and Western States have successfully taught at the Summer Schools. Honorarium: Each mentor shall be paid an honorarium of Rs. 10,000, in addition to actual to and fro travel by train AC II, by the shortest route or Deluxe Bus. In addition, every mentor is also given a sum of Rs. 1,000 as out of pocket expense. The candidate must mention his travel plan in the application form and retain tickets for reimbursement. Boarding and Lodging: Arrangements for boarding and lodging of the mentors shall be made by, and paid for, by the SPSTI. The Interns would not be required make any payment in this respect. Efforts are made to arrange boarding and lodging in the hostels of government institutions/reputed colleges located at the places where summer schools are held. Selection Criteria: Selected candidates will be notified in the third week of April, who will be required to accept immediately, otherwise the offer will be passed to the next in line. The selection criteria are based on several parameters, which include academic performance, subjects of teaching, availability of preferred stations, etc. In the past, girls and boys from all parts of India had applied and taught at the Summer Schools. Certificate: The mentors shall also be given a certificate at the end of the Summer School. Report of the Summer School: All the mentors are required to submit their combined report on the School in a format, to be notified later. Reimbursement: All mentors shall be paid Honorarium and reimbursed travel and other expenses, if any, after the submission of their report. How to fill the Form: The Application Form consists of four stages viz. Personal Details, Educational Qualifications, Summer School Preferences and Additional Information. All the fields must be carefully filled. The Summer School preferences are selected on Drag and Drop basis. The first preference shall be placed on the top. Similar is the case for giving preference for teaching subject.